XAV-939 selectively inhibits Wnt/β-catenin-mediated transcription through tankyrase1/2 inhibition with IC50 of 11 nM/4 nM in cell-free assays, regulates axin levels and does not affect CRE, NF-κB or TGF-β. Fluorescence microscopy of pSuper or Cdo shRNA expressing P19 cells at ITS1 immunostained withβ-tubulin III antibodies. Size bar=100 um. P19/control or P19/Cdo shRNA cells were treated with DMSO or XAV939 in the differentiation medium for 72 h followed by immunostaining. ICG-001 antagonizes Wnt/β-catenin/TCF-mediated transcription and specifically binds to CREB-binding protein (CBP) with IC50 of 3 μM, but is not the related transcriptional coactivator p300. Immunocytochemical analysis of SOX1 (a–d), SOX2 (e–h) and SOX3 (i–l) expression in NT2/D1 cells treated with either DMSO (a, b, e, f, i, j) or ICG-001 (c, d, g, h, k, l). Cell nuclei were stained with DAPI (b, d, f, h, j, l). Scale bar 50 μm. IWR-1-endo is a Wnt pathway inhibitor with IC50 of 180 nM in L-cells expressing Wnt3A, induces Axin2 protein levels and promotes β-catenin phosphorylation by stabilizing Axin-scaffolded destruction complexes. Effect of IWR-1 treatment on total β-catenin levels and adipogenesis in high-passage shSCR and shTCF7L2 cells. Cells were treated with IWR-1 (10 μmol/L) every other day for 6 days during differentiation. Western blot demonstrates the effect of IWR-1 on total β-catenin protein levels at the end of adipogenesis (each lane represents a single independent adipogenesis experiment, n = 4 for each treatment). Wnt-C59 (C59) is a PORCN inhibitor for Wnt3A-mediated activation of a multimerized TCF-binding site driving luciferase with IC50 of 74 pM in HEK293 cells. In vitro treatment with C59 (Wnt-i) decreased the active (non-phosphorylated) β-catenin level in Eed cKO primary rib chondrocytes. Chondrocytes were cultured for 24 h in the presence of C59 (Wnt-i). LGK-974 is a potent and specific PORCN inhibitor, and inhibits Wnt signaling with IC50 of 0.4 nM in TM3 cells. Phase 1. (c) Immunohistochemical images of intestinal sections from E-Rspo2 and R26-rtTA/P-Rspo3 mice treated with either DMSO or LGK974. BrdU was stained for proliferation. Scale bars, 100 μm. SM04690 is a potent and specific inhibitor of canonical Wnt signaling with an EC50 of 19.5 nM for inhibiting the TCF/LEF reporter. It is ∼150- to 500-fold more potent than the other known Wnt inhibitors across multiple cellular assays. Triptonide, isolated from the roots of Tripterygium wilfordii, can effectively inhibit canonical Wnt/β-catenin signaling by targeting the downstream C-terminal transcription domain of β-catenin or a nuclear component associated with β-catenin. It is also an antineoplastic agent, an anti-inflammatory agent and an immunosuppressive agent. IWP-O1 is a porcn inhibitor with an EC50 value of 80 pM in a cultured cell reporter assay of Wnt signaling and effectively suppresses the phosphorylation of Dvl2/3 in HeLa cells. KY02111 promotes differentiation of hPSCs to cardiomyocytes by inhibiting Wnt signaling, may act downstream of APC and GSK3β. Transient Wnt inhibition results in persistent decrease of b-catenin. HTM cells were incubated for 4 days in serum-free media, treated with Wnt inhibitors for 8 days in serum free media, and recovered for 4 days in serum-free media before being fixed and stained for b-catenin. (B) HTM cells treated with 10 μM KY02111 or LGK-974 likewise show a reduction of b-catenin staining intensity. (CeD) Quantification of b-catenin staining intensity in HTM cells from 3 donors indicates a statistically significant decrease in intensity after 0.5 μg/mL SFRP1 (SFRP1), 10 μM KY02111, and 10 μM LGK-974. (E) Western blot shows increased T41 phosphorylation of b-catenin after SFRP1 or KY02111 treatment. Data presented as mean ± SEM. Significant difference from control using Tukey's method denoted by * p < 0.05; ***p < 0.001; using Student's T-test denoted by #p < 0.05. n=3. Scale bar 50 μm. IWP-2 is an inhibitor of Wnt processing and secretion with IC50 of 27 nM in a cell-free assay, selective blockage of Porcn-mediated Wnt palmitoylation, does not affect Wnt/β-catenin in general and displays no effect against Wnt-stimulated cellular responses. KIF3A knockdown promotes both ligand secretion and intracellular signalling of the Wnt/β-catenin pathway in NSCLC cell lines. (c,d) SuperTOPFlash reporter assay to examine the effect of KIF3A knockdown on signalling pathway activation by autocrine or exogenous WNTs in A549 and SW900 cell lines. A549 and SW900 cells were incubated with DMSO or IWP-2 (30 μ M) for 48 h, and then treated with BSA or WNT3A (100 ng/ml) for additional 24 h. Luciferase reporter activity was calculated by dividing TOP/RL ratio by FOP/RL ratio (n = 3; error bars indicate SEM; p-value was determined by one-way ANOVA). *P < 0.05; **P < 0.01. IWP-L6 is a highly potent Porcn inhibitor with EC50 of 0.5 nM. Isoquercitrin, a flavonoid compound with anticancer activity isolated from Bidens bipinnata L, is an inhibitor of Wnt/β-catenin that acts downstream of the β-catenin nuclear translocation. PNU-75654 disrupts the Wnt signaling pathway via inhibition of the interaction (KD50=450 nM) between β-catenin and Tcf4. Salinomycin, traditionally used as an anti-coccidial drug, has recently been shown to possess anti-cancer and anti-cancer stem cell (CSC) effects. WIKI4 is a novel Tankyrase inhibitor with IC50 of 15 nM for TNKS2, and leads to inhibition of Wnt/beta-catenin signaling. PRI-724 is a potent, specific inhibitor of the canonical Wnt signaling pathway in cancer stem cells with potential antineoplastic activity. PRI-724 specifically inhibits the recruiting of beta-catenin with its coactivator CBP. Lpcat3KD 3T3L1 pre-adipocytes were treated with different concentration of Wnt/-catenin pathway inhibitors and then underwent differentiation. The fully differentiated cells were collected. Triglyceride, free cholesterol, and total cholesterol were measured. IWR-1-endo (IC50=180nM) inhibits Wnt-induced stabilization of β-catenin by acting on the target of β-catenin destruction complex in cytosol; PRI-724 (IC50=150 nM) and ICG-001 (IC50=3 μM) inhibit the recruiting of β-catenin with its coactivator element-binding protein(CBP) in nucleus. Values are mean ± SD, n = 3. Bars labeled with different uppercase letters are statistically different (p < 0.05). GNF-6231 is a potent, orally active and selective Porcupine inhibitor with IC50 of 0.8 nM. IQ-1 enables Wnt/β-catenin-driven expansion of mouse ESCs and prevents spontaneous differentiation, Maintains embryonic stem cell (ESC) pluripotency in Wnt3a-treated cells and prevents PP2A/Nkd interaction. KYA1797K is a highly potent and selective Wnt/β-catenin inhibitor with IC50 of 0.75 µM (TOPflash assay). Methyl Vanillate, one of the ingredients in Hovenia dulcis Thunb, activates the Wnt/β-catenin pathway and induces osteoblast differentiation in vitro. Wnt agonist 1 is a cell permeable Wnt signaling pathway activator, which induces β-catenin- and TCF-dependent transcriptional activity with EC50 of 0.7 μM. 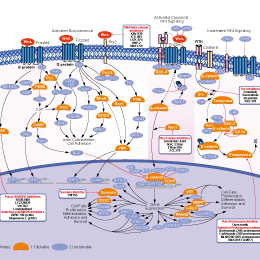 WAY-316606, a specific antagonist of SFRP1, functions as an inhibitor of canonical Wnt/β-catenin signalling in the human hair bulb. iCRT3 is an antagonist of Wnt/β-catenin signaling with an IC50 of 8.2 nM in the Wnt responsive STF16-luc reporter assays. SKL2001 is a novel agonist of the Wnt/β-catenin pathway. It disrupts the Axin/β-catenin interaction.